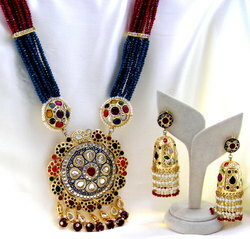 Kundan Meena Necklace Set is very gorgeous is used specially for weddings. The concepts of Kundan jewelleries are very old and it carries craftsmanship of the Mughal era. We deal in Kundan Meena necklace sets which includes necklace, pair of earrings and bangles altogether. These are designed for weddings and anniversaries. 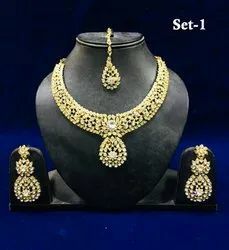 Designer Necklace Sets With Gold and Silver Stones. Heavy Necklace With Heavy Drop Earrings And Maang Teekas. Party wear high quality exclusive jadau kundan necklace set , to enhance the personality of wearer .